Just as I was about to give up on noon class today Akiko San walked through the door. She chirped, "Ohio Gozimas!" and I returned the greeting. I immediately thought of the last time it was just Akiko and I for noon class; that day last week Sensei spent nearly a half hour teaching us the first two jo suburi: Choku Tsuki and Kaishi Tsuki. 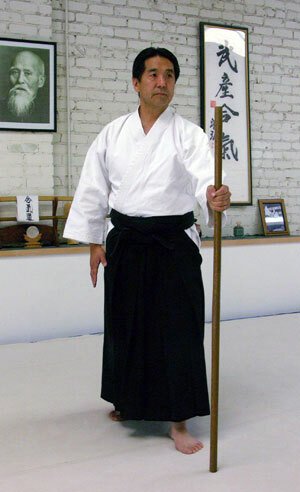 As Sensei walked toward the changing room today Akiko asked, "can we do some more with the jo?" Sensei nodded and we went to unzip our weapons bags. After we bowed in he said, "let's start with Choku Tsuki." He said that people don't realize that, while there is a lot going on in making what looks like a simple thrust, it really boils down to just a few elements. After the opening stance, shown in the first photo, the first move is to step off a little to the left and bring the jo up to a mostly horizontal position. That's a transitional position in which you've moved out of the opening hanmi and into the thrust. That's the position shown in the second photo. 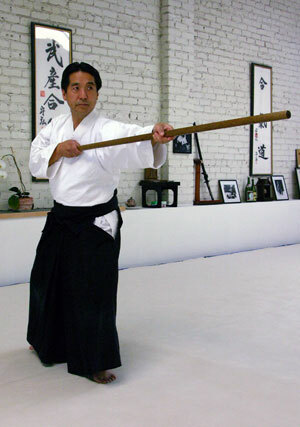 Reaching the final posture, the thrust is extended forward and the back hip circles to the right, lining up the body in Hitoemi, aimed right at the target. That's the position shown in the third photo. You can see how Goto Sensei's body nearly disappears, like a galaxy viewed on edge. He repeated: "step one, get off line and bring up the jo; step two, rotate the back hip around behind while thrusting and sinking at the end. One [demonstrates], Two [demonstrates]." I tried it. One. . .Two. One. . .Two. It was hard to do all of move One during move One. Parts kept spilling out into move Two. Move Two was easier, if only you did move One right. We did this for a while, actually about 15 minutes. Then we practiced the same thing with the second jo suburi, Kaishi Tsuki. One. . .Two, and there went another 15 mintues. This kept alive our four-suburi-per-hour pace established at class last week. As we continued I was mildly astonished at how completely different Choku Tsuki felt doing it in those two steps, different but simpler and more accessible. Goto Sensei elaborated on the finish. "Don't forget to sink at the end," he said. He told a story about how, back in Iwama, the students would tie a rope around a tree trunk and make thrusts into the middle of the tree. "Of course, the tree never moved, but if we didn't sink we would get bounced backward." After a period of time, (I wondered if it was anywhere near 15 minutes, but decided it was probably far longer) he said, "we'd find a way to sink into the thrust and not get bounced backward by the tree." After such an extended look at Choku Tsuki and Kaishi Tsuki we practically raced through the next seven suburi, again taking them in steps to make sure we weren't cutting corners. But the time we spent on Choku Tsuki seemed to have made everything seem simpler and more sensible. 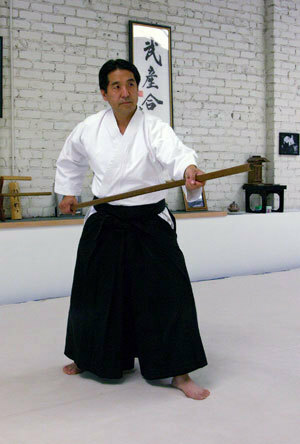 I remembered how Tatoian Sensei would now and then just let us do Tai no Henko for an entire class. It was the same thing: focus on a fundamental element in order to make everything that followed simpler and maybe even a little easier. Wonderful to discern about the thrust which is extended forward and the back hip circles,the sort of information given is really superior. The information is great based on the University of Choku Tsuki,although the facts are really amazing. Fds, mas que crl, ente3o mas eu procuro por foocbaek.pt no google e aparece-me esta merda?! publicidade de relogios para venda e afins?! mas que merda, porque raze3o ne3o fazem as coisas como deve ser? este3o a tentar ganhar o quea e com quem?! palhacos!!! fds, eh pah fae7am por ser dignos de se intitularem uns .PT sem falsidades, falcatruas e corrupe7f5es!!! Glad to see you've got the finish and rerseve action in the equation,like it. Something that really helped me with this whipping action was training with a guy on a Goju karate course and he started shaking' so I copied him. We were doing a drill where the techniques were progressively becoming smaller' and faster as a result. The shaking' meant that I had no chance of being able to block' my training partner so I stopped trying as such.Over the weeks I started messing around with this shaking and was surprised to notice the punches flying out on their own almost. This was when I started to get a realisation of throwing the punch. I sometimes get people to shake like a dog' in the mirror, it helps get the rerseve action going. In effect it is the pull back' you mention for the single punch.This really only started me off, it was much later, away from Trad Karate where I learnt how to punch porperly.I'm enjoying these posts, you're doing a good job of explaining a difficult topic, you're not wrong about people struggling with this stuff. I like it thanks for sharing such a brilliant information, great blog..